The Fed, led by Chairman Jerome Powell, met this past Wednesday and decided to leave the Fed Funds Rate unchanged at 2.50, as expected. They also issued their Monetary Policy Statement which includes their outlook on the economy and its interest rate forecast. 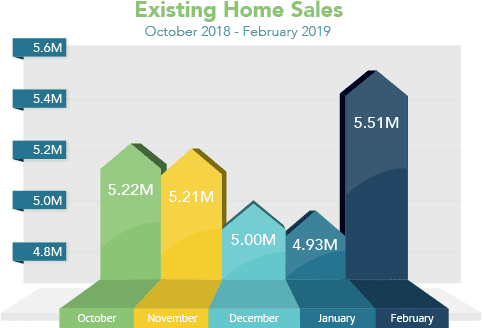 Bottom line: The spring housing market could be one of the best in years thanks to a solid economy, relatively low rates, a positive wealth effect thanks to the rise in stocks and a Federal Reserve that said rates are not likely to rise anytime soon, if at all. After the Fed lifted bond prices last week with a dovish Monetary Policy Statement, the markets in the upcoming week will have to deal with a bevy of economic data. The big report will be Friday’s Core PCE (Personal Consumption Expenditures price index). This report measures price changes for household goods and services, and is the preferred method for the Fed when measuring consumer inflation in the United States. Last week, the Fed said inflation will continue to remain low, and the non-threat of higher inflation is one of the factors leading to the complacency and calm in the financial markets. However, inflation can grow quickly and a trend worth following is rising wages, which is currently sitting at 3.4% year-over-year, and the highest levels in ten years. As wages rise, people have more disposable income which creates a higher demand for goods and services, thereby driving prices higher. Remember that inflation is the driver of long-term rates like mortgages – not the Fed. So, if inflation remains low, as many expect, then rates will also remain low. If inflation ticks higher, home loan rates must go higher as well. Housing data will be plentiful with Tuesday’s S&P Case-Shiller Home Price Index, Housing Starts and Building Permits. Pending Home Sales will be released on Thursday. Consumer Confidence will be delivered on Tuesday with Consumer Sentiment on Friday.